This observation has been substantiated since he proposed it in 1965. Yet, it is improbable that Moore could have predicted the degree of the electronics revolution in progress at present. Currently, a new class of devices, with peculiar properties, is being created. With the rapid progress in ultra-miniaturization, scientists have started to investigate the intersection of chemical and physical properties that occur at the molecular level. Progresses in this fast-paced field could enhance devices for information processing and data storage and help in the development of molecular switches, apart from other innovations. 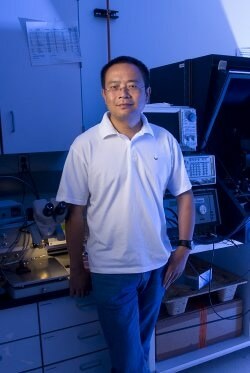 Recently, Nongjian “NJ” Tao and his colleagues described a sequence of studies about electrical conductance through single molecules. Several challenges are faced while attempting to create electronics at this infinitesimal scale. In this ultra-tiny world, the unique properties of the quantum realm hold sway. In this case, electrons that flow as current act as waves and are subject to a phenomenon called quantum interference. The potential to tweak this quantum phenomenon could pave the way for innovative nanoelectronic devices with peculiar properties. We are interested in not only measuring quantum phenomena in single molecules, but also controlling them. This allows us to understand the basic charge transport in molecular systems and study new device functions. In a study published in the Nature Materials journal, Tao and colleagues from Japan, China, and the United Kingdom describe experiments where a single organic molecule is suspended between a pair of electrodes while passing current through the tiny structure. The scientists investigate the charge transport properties through the molecules. They showed that it is possible to precisely modulate a ghostly wavelike characteristic of electrons—called quantum interference—in two different configurations of the molecule—Para and Meta. It appears that quantum interference effects can lead to considerable variation in the conductance properties of molecule-scale devices. The team demonstrated that by manipulating the quantum interference, it is possible to fine-tune the electrical conductance of a single molecule by more than two orders of magnitude. Achieving precise and continuous control of quantum interference is regarded as an important recipe for the future advancement of broad-ranging molecular-scale electronics, which operate at low power and high speed. Single-molecule devices such as these could prospectively function as rectifiers, transistors, switches, wires, or logic gates and could find applications in futuristic applications, such as quantum cryptography, superconducting quantum interference devices (SQUID), and quantum computing. For this research, the molecules—ring-shaped hydrocarbons that can occur in various configurations—were used since they are among the most versatile and simplest candidates for modeling the behavior of molecular electronics and are perfect for observing quantum interference effects at the nanoscale. The so-called break junction measurements were performed to investigate the manner in which charge moves through a single molecule. The tests are performed using a scanning tunneling microscope (STM). The molecule under study is balanced between a gold tip and gold substrate of the STM device. The STM’s tip is repeatedly brought into and out of contact with the molecule, thereby breaking and reforming the junction when the current passes through each terminal. Thousands of distance versus conductance traces were recorded, with the specific molecular properties of the two molecules applied for the experiments modifying the electron flow through the junction. Molecules in the “Para” configuration demonstrated higher conductance values compared to molecules of the “Meta” form, suggesting constructive versus destructive quantum interference in the molecules. The researchers could achieve continuous control of the conductance more than two orders of magnitude by using a method called electrochemical gating. Earlier, the charge-carrying molecule used for the device was required to be modified for altering the quantum interference properties. This study was the first to achieve conductance regulation in a single molecule. As noted by the authors, at the molecular scale, conductance is sensitively influenced by quantum interference involving the molecule’s electron orbitals. Particularly, interference between the highest occupied molecular orbital (HOMO) and the lowest unoccupied molecular orbital (LUMO) seems to be the dominant determinant of conductance in single molecules. It is possible to subtly tune the quantum interference in the molecules by using an electrochemical gate voltage. The scientists could demonstrate the excellent agreement between experimental results and theoretical calculations, suggesting that the LUMO and HOMO contributions to the conductance were additive for Para molecules, leading to constructive interference, and subtractive for Meta, resulting in destructive interference, quite similar to the way waves in water can combine to form a larger wave or cancel each other out, based on their phase. Although earlier theoretical calculations of transport of charge through single molecules had been performed, experimental verification has had to wait for various advances in scanning probe microscopy, nanotechnology, and techniques to form electrically functional connections of molecules to metal surfaces. Currently, with the potential to delicately modify conductance by manipulating quantum interference, the field of molecular electronics is open to a wide range of inventions.